1. Cream together 1 cup butter or margarine, egg yolks, and 2 cups white sugar. Alternately mix in flour and buttermilk. Add baking soda. Mix in 1 cup walnuts and coconut. 2. Beat egg whites, and fold into batter. Pour batter into three greased and floured 9 inch round cake pans. 3. Bake for 20 to 25 minutes in a preheated 350 degrees F (175 degrees C) oven. 4. Combine cream cheese, 1/2 cup butter or margarine, confectioners' sugar, and vanilla extract. Spread onto cooled cake. 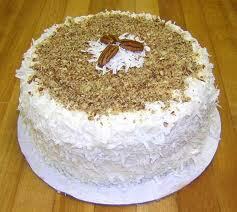 Top iced cake with chopped walnuts. The Italian cream cake recipe is ready to serve..nice !